The forests that surround Mt. 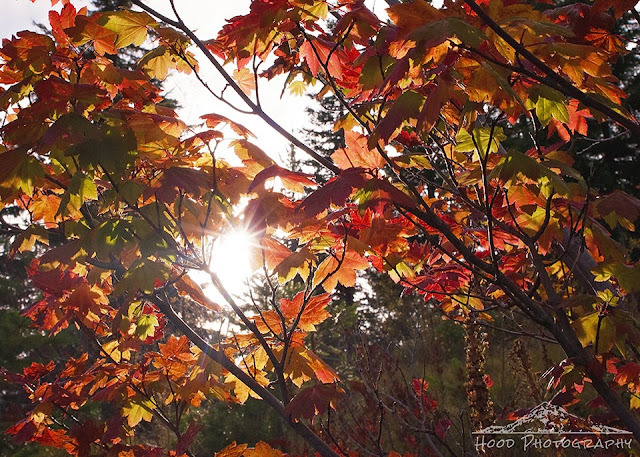 Hood are full of vine maples, which are quickly turning their leaf colors. They are often the first to change, and this past weekend on a hike, the hillsides were covered in exposed bushes that were all red, orange and yellow. I really like this sunshine photo. A very pretty display of autumn colours. Love the fall colors... Great capture! Ah, so pretty. We are not in any fall color yet, I am patiently waiting for it. So, glad you linked this shot to LTTL. Maples give the best colour! Great shot!